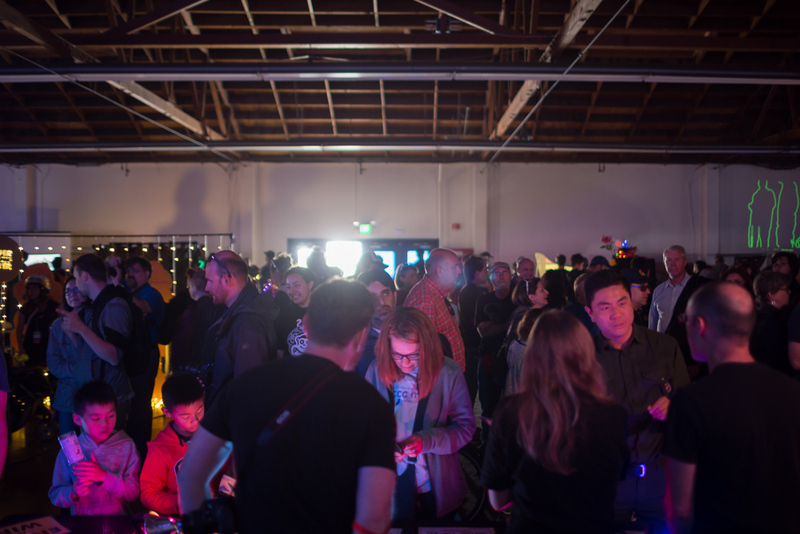 Maker Faire 2018 was a different experience this year. In the past, the dark room was set up in the larger Fiesta hall. This year, we were located in Redwood hall. It’s quite a bit smaller. 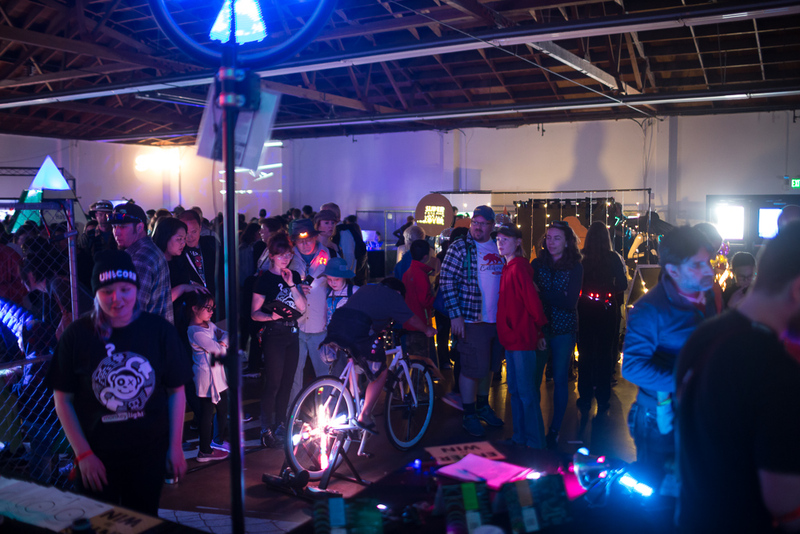 The vibe was a little different, but we had a grand time as usual with our interactive exhibits: The Selfie Bike, The Speed Bike, and Draw on the Wheel. We felt a little caged in with the chain-link, but got along just fine at our booth. The show got off to a somewhat humorous start when the electrical contractor cut the overhead lights and power. No big deal though. Fifteen minutes later, we were back in business. 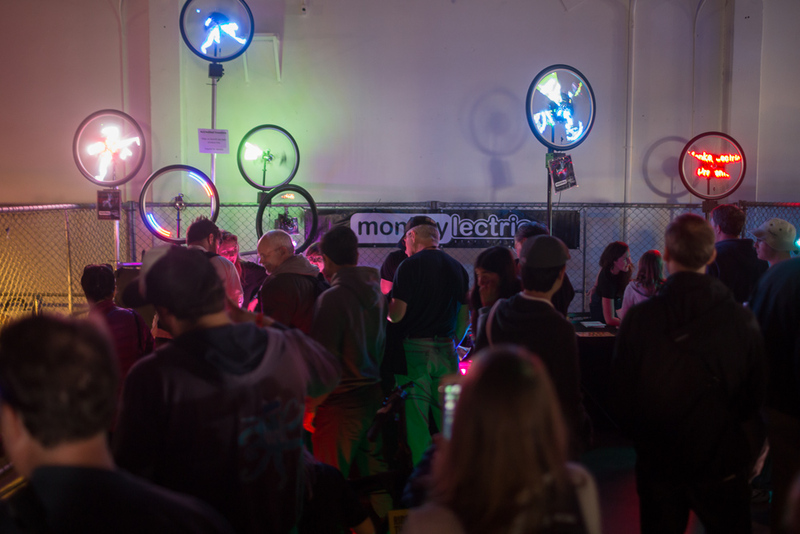 Our Selfie bike was powered by one Monkey Light Pro and a bike on a trainer, and an implementation of our API for the Monkey Light Pro. We transferred photos from an iPad to a Macbook for image processing and then sent the images over to the Monkey Light Pro via Bluetooth. We took photos of volunteers in the crowd, and then they got the unique opportunity to see their face lit up on a bike wheel in full-color LEDs. We also put our M204, M210, and M232 on our wheel spinners for full display. We brought along our new USB rechargeable battery pack, which was funded via Kickstarter, and is now a reality thanks to Kickstarter backers. We also displayed our newest models, the M204R, M210R, and M232R. Our Draw on the Wheel exhibit is a great one for kids: They can draw their own art on a paper wheel, and once again, using our API, we put their image into a spinning bike wheel. We scan the image with a standard flatbed scanner, then do some image processing, and then run a Perl script to send images up to the wheel. 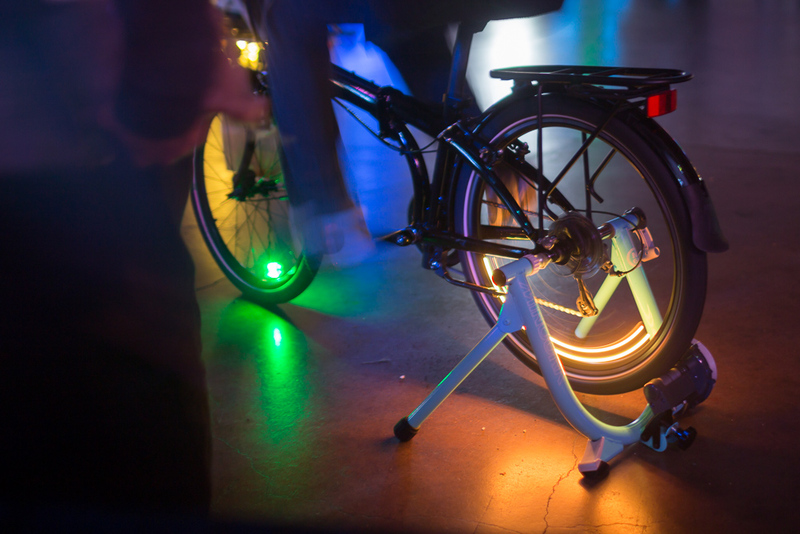 Our newest exhibit was the speed bike, which featured the first public debut of a prototype A15 light. 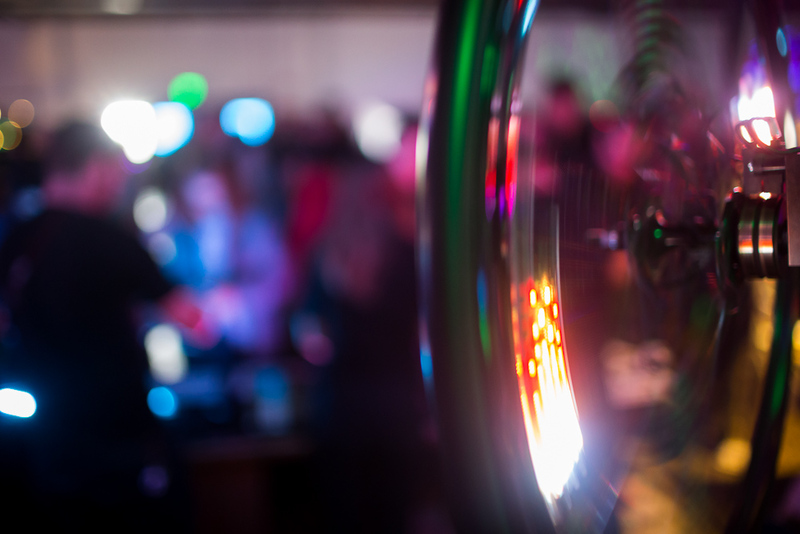 This is one of the lights from our most recent Kickstarter, and is still in its development. 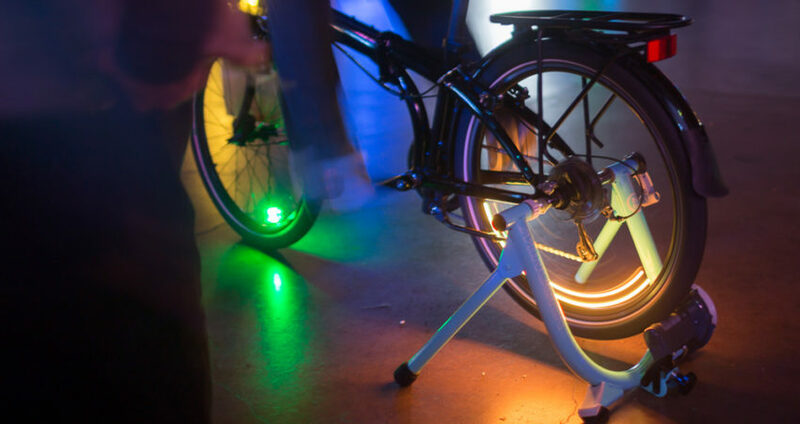 The light turns on automatically when the wheel spins, and can change colors depending on how fast you are riding. While their kids were pedaling, some parents joked about this being the only way to get them some exercise! These lights are not available yet. When they are, Kickstarter backers will get first dibs, and then we’ll make it available to the general public. Thanks for visiting our booth, if you were able! It’s always great to share our experience with our lights and to share some good conversation with you all!